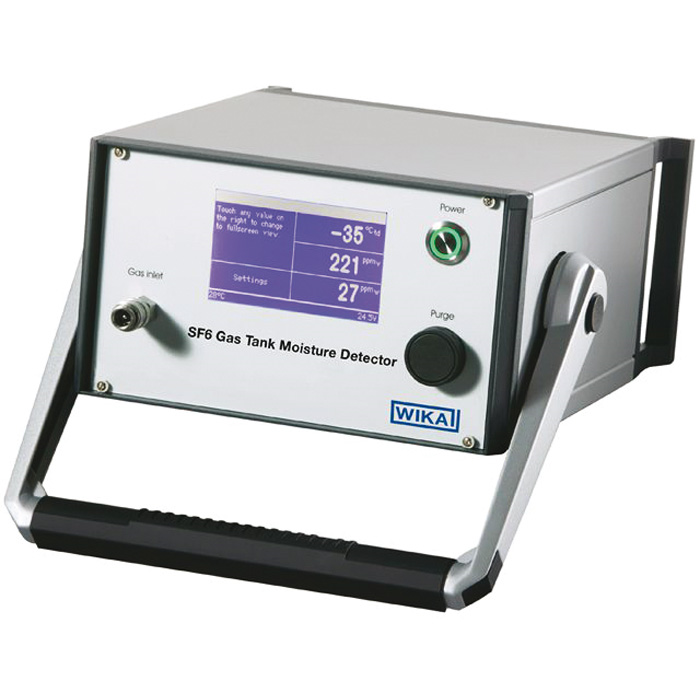 The analysis instrument model GA20 is used for determining the humidity content in SF6 gas. Due to the procedures of filling and servicing equipment, a residual humidity in SF6 gas is inevitable. However, humidity must be kept as low as possible for guaranteeing a faultless long-term usage. The GA20 enables easy measuring operations and quickly delivers meaningful results. Adapters required for connecting the GA20 to the respective gas compartment are available as an option. The solid measuring tube has self-closing quick couplings on both sides in order to prevent the SF6 gas from accidentally escaping into the atmosphere. While the test gas is streaming through the measuring chamber for approx. 5 minutes, the dew point is indicated directly. The dew point temperature and the humidity concentration are shown both volume-referred and mass-referred in ppm on the display at the same time. Due to the short test duration, only minimal amounts of SF6 gas are necessary. The test gas should be intermediately stored at the outlet of the GA20 with a gas recovery bag so that the environmentally hazardous SF6 gas does not escape into the surrounding atmosphere. The influence of the ambient temperature fluctuations is compensated in the GA20. The instrument controls the flow automatically and reproducibly. Thus erroneous measurements due to operating errors are virtually eliminated.